This sign is one of the beneficiaries of the company’s quick change innovation. Quick change is a patented feature that allows signs to be changed easily and relatively fast. The sign are slid into place between two protrusions on the sides without sticking or piercing. It is made of all plastic so it can be used indoors as well as outdoors and it can hold two signs on both sides. The hinges lock themselves when the sign is opened. This sign also has ballasting columns where you can add sand to increase the weight of the sign. This sign would be perfect for restaurants which have to change their main menu on a daily basis. It measures 46.375”H x 3.125”D x 27.125”W. Unfortunately the signicade does not have quick change. Otherwise it has very similar features to its deluxe version. It is still all plastic and it can hold two signs measuring 24”W x 36”H. It has a handle for easier carriage and it can be ballasted with sand on the inside. It could be a great option for placing outside your store to showcase your offers. The dimensions are 45”H x 3”D x 25”W. There are of two types, one with the quick change feature and the other with a snap frame. They get the name from their ability to withstand very strong winds which is a disadvantage that plagues many signs. Are three types according to the size of signs they can hold i.e. Wind Sign Deluxe 28" x 44", Wind Sign II 24" x 36" and a small 22" x 28" Sind Sign. The deluxe version can resist head-on winds of up to 60mph while the Wind sign II can withstand up to 60mph. There are two types also according to the sizes of the signs they are able to accommodate. 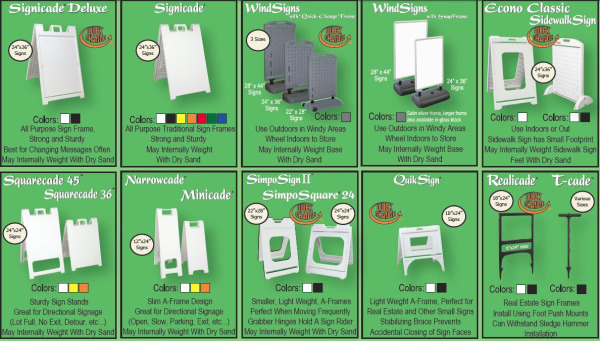 Wind Sign Deluxe holds signs measuring 28" x 44" while the Wind Sign II holds signs with the 24" x 36" dimensions. They both have coil springs which return the signs to an upright position every time they fall over. One of the most stable signs around and it can hold two signs measuring 24"W x 36"H. The quick change feature is available for easy exchange of signs. It has outrigger feet that can be easily slid into place without the use of tools. Dimensions: 40.70”H x 16.92”D x 30.66”W. We have a great collection of different signs suited for different preferences. All these signs are supplied by Plasticade and are of the highest quality. For more information or pricing, please contact The Sign Studio @ (818) 843-9200 or send us an e-mail at Info@SignStudioLA.com.